A14 Girton to Histon Pinch-point Scheme | NEWS for Histon and Impington. Costain has told us that it will be working with the Highways Agency on the delivery of planned road improvements on the A14 in Cambridge between J31 at Girton and J32 at Histon. The improvements are part of the targeted improvement programme and pinch point programme and are by their very nature intended to improve traffic movements through this extremely busy section of road. Read below or click here for the full text of its ‘works information’. 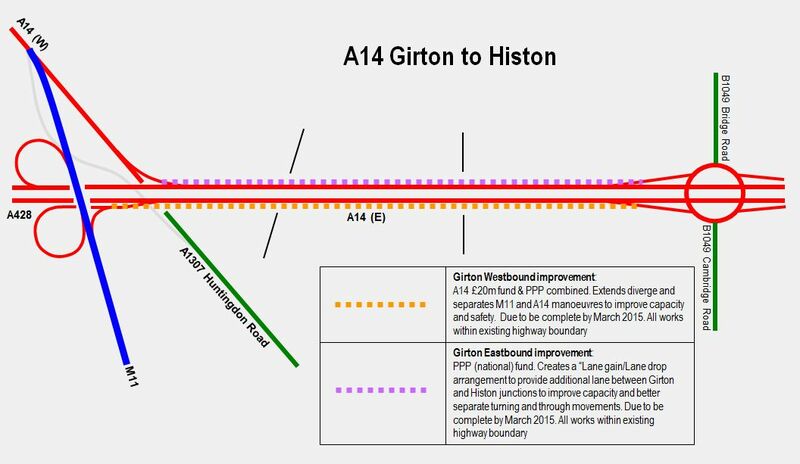 The improvements which include adding an additional lane in both eastbound and westbound directions and improving the existing westbound slip roads at the Girton interchange (to both the M11 and A14), will start week commencing the 14th April and are likely to take up to 10 months to complete. The project enabling works or set-up arrangements will involve lane and carriageway closures to provide for the safe establishment of site traffic management, designated working areas and the installation of temporary speed cameras. The arrangements will be limited to and planned over a three week period before and after Easter and undertaken at night with two lanes in both directions maintained during the day time to support peak time traffic. There will be no night closures over the Easter holiday period. The first stage of the enabling works will start on Monday the 14th April with the inner lanes of the eastbound and westbound carriageways closed overnight on Monday, Tuesday and Wednesday. No diversions will be required and a 50mph speed limit will apply for the duration of the lane closures. The second stage will commence on Tuesday 22nd April with full carriageways closures on either the eastbound or westbound carriage during the week again overnight. Further and more detailed information about the closures along with diversion routes for the relevant carriageway closure will follow next week and will be available on the Highways Agency website detailed below. If you have any questions regarding the project, you can contact Brian Greaves Costain’s Community Relations Manager on the 24 hour project helpline 0845 600 2664.